The 9th house rules higher education, philosophical pursuits. long distance travel, and the law. Higher education refers to your secondary education, like college. This house shows what kind of philosophies you subscribe to. Travel that's far from home falls here. Any legal dealings are 9th house matters. 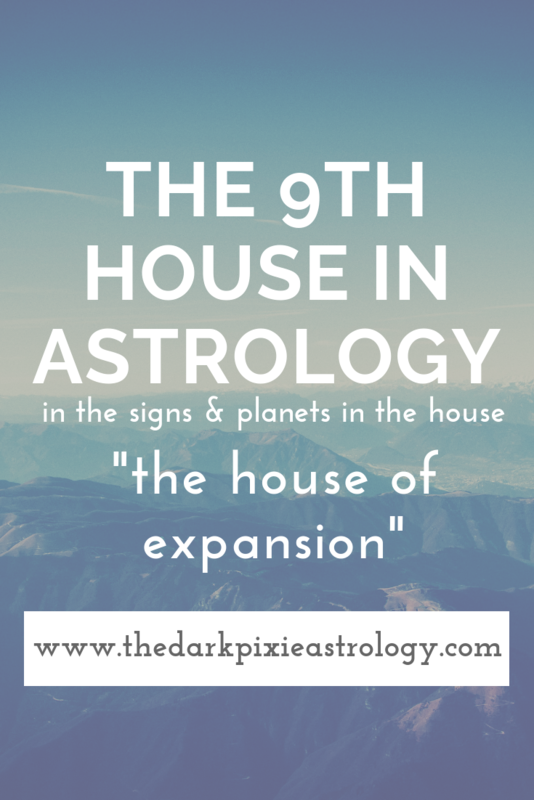 The 9th house is also a house of communication (along with the 3rd house/they are opposing houses and on an axis). It rules writing (and writers) and publishing (and publishers). This house is optimistic and forward thinking in an abstract way. The 9th house is ruled by Sagittarius and Jupiter, and is a cadent house. You enjoy going on adventures, and you have no problems coming up with plans to do work that’s new and interesting. You have an optimistic attitude, and you feel that you can get anything done that you really want to. You tend to be a traditional person and don’t break out from what you were raised to believe very often. You stick to what you know, and avoid anything new or different. You like to travel, especially to beautiful places. You’re logical when it comes to your beliefs, thinking them through and asking about the facts. Your actual beliefs may vary, and you lose interest in them quickly. You have a thirst for knowledge that needs to be quenched. Your emotions influence your beliefs, and you go with what your feelings tell you. You like to do work for other people. You prefer going away from where you grew up, and find you’re comfortable in foreign places and know how to adapt to various cultures. Your belief in yourself is strong, and you’re a naturally confident person. You love to learn, and you especially love to travel. Being stuck in one place won’t do it for you. You may find that traveling is one of the best things for your soul. You’re a logical person when it comes to your beliefs, and you like to study various beliefs and cultures. Whatever you do believe, you know a lot about, and you’ve studied it thoroughly. You have a strong sense of equality, fairness, and justice, and want people to be treated well. You enjoy learning, and you feel that you should always put your best foot forward. You give all beliefs and cultures respect. You’re interested in the mysteries of life, and will research beliefs that may be taboo or dark. You want to know what makes the world tick. You throw yourself into learning whatever interests you. You want to expand your mind in life, experience what the world has to offer you, and are always looking for more from life. Your beliefs aren’t radical, but you’re a positive person and want to have a good standard to live up to. Your beliefs tend to be conventional, and you don’t buy into ideas that seem far-fetched. You require facts and figures in order to believe in something. You may not like to travel, and will only do so when required for work or to fulfill a responsibility. Your beliefs tend to be unconventional, and you’re open to many different beliefs. You like to surround yourself with people who will challenge your beliefs, and you’re a progressive person. You enjoy travel, and do so to shake things up in your life. Your beliefs are important to you, and you apply them to your daily life. You may be fiercely spiritual or religious, and believe this helps you solve your problems. Travel may not be something you do often, and you prefer to be around water. Expanding your mind can make you feel best, and you want to learn about other ways of life. Whatever your life is, you’re intrigued by the opposite, so if you grew up normal, you like eccentric, and if you grew up eccentric, you like normal. You can be interested in philosophy, maybe quoting the great minds of the world, though at times you may not fully understand it. Travel can be good for you, especially to foreign lands, and eating foods from other cultures and learning new languages may interest you. You may have many interests and hobbies, and you don’t mind sharing what you know with others. There can be a sense of pervasive restlessness that requires you to constantly be on the go, and you may have difficulty putting down roots. Your home is the road, or some faraway place in your head. Learning to appreciate the present and what you have at this moment is something that will have to be cultivated, otherwise you’ll never really be happy, always looking for the bigger, better deal. You need a life that allows you to explore while still being able to enjoy the moment. With your natal Venus in your 9th house, you’re interested in people who are from a different country, culture, or background as yourself. You want someone who will teach you things and you can teach them, who’ll share experiences with you, and who won’t be clingy. If someone can help you grow as a person, you’re all theirs. You want to have fun with your partner, and you can have a hard time committing, believing that there’s always something better out there waiting for you. You love debate, like to learn about philosophy, want to travel, and can be a good writer. With your natal Mars in your 9th house, you love a good debate, and can argue with someone over any opinion. You defend your beliefs well, but need to watch for being overly preachy or aggressive about it. You’re an honest person, humorous, and love to laugh. There’s so much fun to be had and you don’t want to focus on the serious matters. Your energy is for acquiring new knowledge and having new experiences that broaden your mind so you can teach others, and for being as free as possible. You love to roam, travel, and be exposed to other cultures. With your natal Jupiter in your 9th house, you need to learn as much as you can. Life is one giant learning experience for you. You could love school, get multiple degrees, or spend a large chunk of your life in school. Even if you hated school, you still love to learn, and experience can be a good teacher. You can be a good teacher as well, wanting to share everything you’ve learned. You can also be a writer or in publishing, being a natural storyteller, love to travel to exotic places, and have an interest in cultures that are different from your own. With your natal Pluto in your 9th house, you strongly believe in your beliefs, and can have a hard time accepting differing views. You try to sway people to your side, and you may be successful for the most part, but become enraged when you encounter people who won’t agree with you. You want to expand your life in ways that allows you to have transformative experiences. You can express yourself passionately and intensely, and inspire others through your expression. With transit Mercury in your 9th house, you’re a great conversationalist. You have plenty of stories to tell, and you’ll tell them to anyone who’ll listen with gusto and flair. You’re storytelling skills are through the roof, and you may want to begin a writing project. This is also a good time to go back to school or pick up something new, especially a new language or something related to other cultures. You could do a little traveling, or have more communications with people from different cultures than yourself. You can come up with big ideas, grand ideas, and can work on devising a plan to make them happen. You’re less serious and more playful.